GUT HEALTH: Supercharge your digestion with easy to digest, gut health promoting Grab-N-Go Bars. Added collagen supports the inner wall of your digestive tract and getting the nutrients and benefits of homemade bone broth collagen in a convenient Bar, satisfying delicious Organic Coconut & Almond flavor with No Broth taste whatsoever. SKIN, HAIR & NAILS: Get stronger hair, nails and plumper skin, collagen is shown to support these benefits. 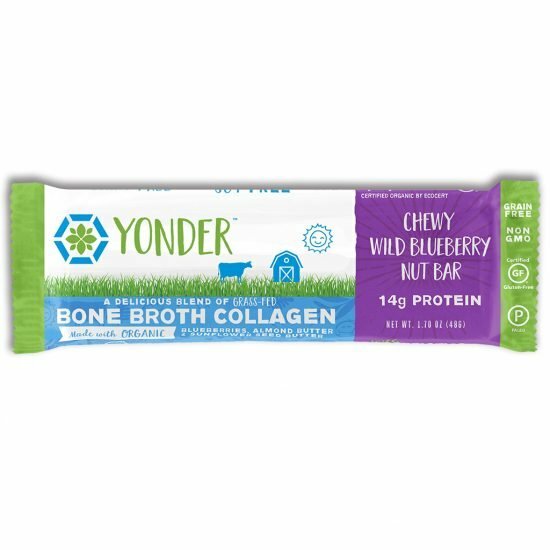 Our Bars promote healthy levels of collagen within the body, muscle building, and connective tissue-building. SUPERIOR QUALITY: We source ALL of our nutrients from clean sources, our bone broth is sourced European Grass Fed & Pasture-raised animals with no added hormones or antibiotics. Our formulas are co-created with a Ph.D. Naturopath 30-year expert nutritionist who also cares deeply about your health. No fillers, synthetic or artificial ingredients, our blends are free of Guar Gum & Xanthan Gums and Rice Proteins. We AVOID them! Chewy Bars: when we chew, digestive enzymes are released in your stomach and when we slow down our eating, it supports better digestion as well as nutrient absorption… Our bars are all about nutrients, good taste, and supporting digestive/gut health! With added prebiotic fiber also to support the good bacteria in gut and healthy bowel movements. Manufactured in a facility that processes nuts, tree nuts, peanuts, seeds, soy, wheat, and dairy (milk). ** Net Carbs equal Carbs minus Fiber. Loved this bar!!! I train for endurance sports and I need to fuel as I am training. I have had a challenging time finding fuel that doesn’t upset my stomach. This bar does the trick and it is delicious!!! Love the almond coconut flavor!! 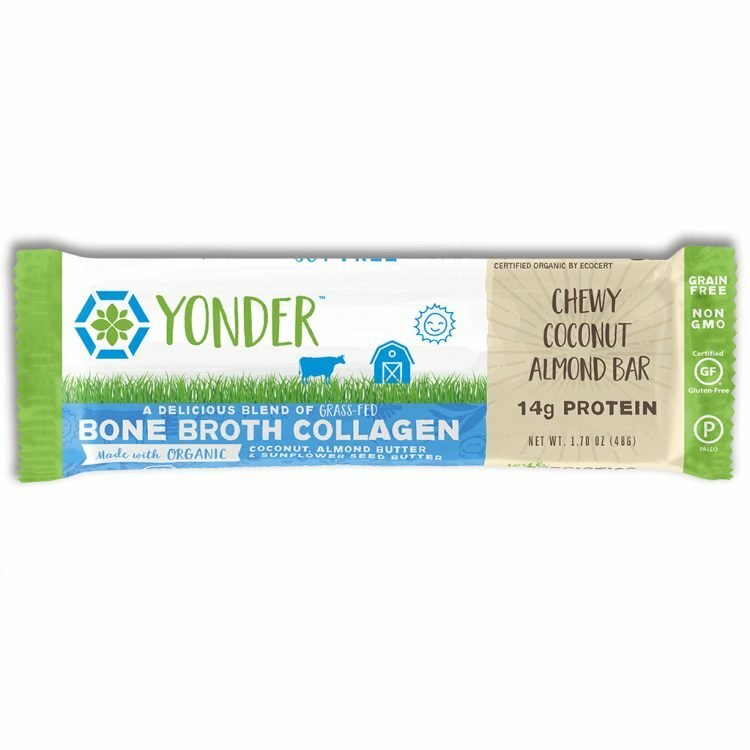 Almond Butter based bars are my favorite and this one exceeds my expectations! Love the smooth texture of the bar, it’s not crumbly or dry at all. Now I don’t have to drink Bone Broth as a soup everyday. I can have it in a bar that tastes like dessert! Great bar. Most protein bars bloat me, but this one is so easy on my digestive track. I’m so happy to have a delicious and nutritious, “on the go” snack, with such clean ingredients!! Bars taste natural and organic with a solid consistency…. happy medium between nutritional value and excellent taste. The perfect snack!! Love these bars! Gave up on bars a while ago as they either tasted chalky or had too much sugar. So happy to have found these. Great taste, excellent ingredients and perfect nutrition. The coconut almond is my favorite. I like that the moment you bite into it, your mouth explodes with coconut taste. I love everything about these bars and will definitely be purchasing some, once in stock! These bars are awesome! I could not decide which one was my favorite because they are all so delicious. I am impressed how clean sourced they are and full of nutrients, a blessing to the body. Finally, a bone broth supplement that is truly healthy and tastes great. I look forward to selling these to my patients and feeding them to my family. Finally a bar that is full of goodness and actually tastes yummy too!! I love all of them but the wild blueberry is my favorite. Can’t wait to try the protein powder!! So excited. Coconut almond is definitely my flavorite favor! I’m so excited about it I can’t even speak correctly. Definitely give these a shot. Great, filling snack. Excellent bars! Love the taste of the coconut almond and the texture of it. Thank you! Enjoying these as an occasional meal or even a quick yummy snack! Loved the taste! Didn’t have that odd mouth feel that many bars have. This was my third flavor to try and it’s my favorite! So good!! I can’t wait to try the protein powder too! This bar is delicious! I am not typically a huge coconut fan but this flavor combination is truly declious! Such an easy, healthy and enjoyable way to get protein and healthy nutrients! I look forward to waking up each morning to having a delicious Yonder Bar. So far, the chewy coconut almond bar is my favorite! They keep me satisfied for hours! Thank you for creating such an amazing and nutritious bar! Really like the bars. They taste so much better than the alternatives and I love that they are actually better for you! Most importantly, my mother can tolerate them. After surviving bile duct cancer, her digestive system is not what it used to be. Eating has become such a chore for her. It’s great that she can have these bars to get some protein without having a stomach-ache after eating. I can’t wait until there are other flavors and we can buy them in a retail setting! Copyright © 2019 Yonder · All Rights Reserved · Powered by BizBudding Inc.